In the Central African Republic, 45-year-old “Theodore” was captured by an armed group in February 2017 during an attack on his village of Mingala in the country’s southeast. He was taken with 21 other men to a nearby ad hoc rebel military base and locked up in a house-turned-prison guarded by six armed men. In Donetsk’s Lenin Square, Yuroslav Korotenko keeps a constant vigil inside a tent erected just a few feet away from a massive statue of Soviet leader Vladimir Lenin. Crimean officials have reported that roughly 97 percent of Crimeans voted for independence from Ukraine on Sunday, with a turnout of about 80 percent. Yet the security situation in Crimea has led many to question how free the vote really was. Aid organisations say a small handheld computer will allow them to more rapidly assess where food aid is needed most urgently. As a result, fewer Burundians will suffer hunger this year. 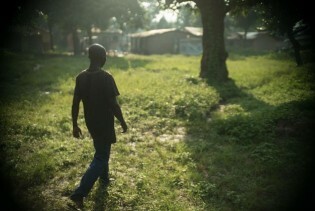 When Timothy was forced into the southern Sudan People’s Liberation Army (SPLA) at age 11, the first thing they did was beat him. Then they took him to a military base where his tasks were to carry other soldiers’ bags, wash their clothes, collect firewood for them, and cook their food. As voting concluded in Rwanda’s presidential elections, with incumbent President Paul Kagame expected to win by a landslide, fears remain that not all citizens will accept the results amidst claims the elections were neither free nor fair. The coalition of 11 major opposition parties which boycotted July 23 national assembly elections will also boycott elections to the senate on July 28. The Alliance of Democrats for Change, as the coalition is known, claims that two previous polls - to elect Burundi's district administrators and the president - were characterised by "massive fraud". A new documentary ‘Diary of a Disgraced Soldier’ follows the dismissal from the British army of an Iraq war veteran and his battle with post traumatic stress disorder (PTSD) linked to his videographing the brutalising of Iraqi youth by fellow servicemen. Some 1,700 Palestinians in the West Bank village of Bi'lin have been promised land, but so far it has not been delivered. It started with a murder. "I'll go to any country," says Zirgon Tomas al-Aya, a 60-year-old Iraqi standing outside the UN Refugee Agency headquarters in Damascus. "Parliamentarians, shame on you!" read a sign in Bosnian carried by four union workers in downtown Sarajevo. Nibaal Shriteh may soon be homeless. The 17-year-old Palestinian lives in a Hebron orphanage but, if the Israeli military has its way, she and 240 fellow orphans like her will be out on the streets. The young man who agreed to be called Hamed has come a long way to do nothing. The Ivoirian would prefer to work but, after sneaking into Israel from Egypt about a month ago, he's got nothing better to do than sit in a park everyday in central Tel Aviv, wait, and hope for a government decision on his refugee application.